Wren is a 178. The top of the top in a group of reanimated humans. The longer you are dead, the more deadly you are, and Wren is deadly. At 178, Wren is faster and has higher senses than most other Reboots. And she like it that way. When Callum, a new Reboot, enters into the Reboot program as a 22, it seems that he is done for. To make it as a Reboot, the higher your number, the better your chances. But Callum isn't give up so easily.It never fails. Mention robots, dystopian, and / or post-apocalyptic something and I am all over it. Reboot is a prime example. 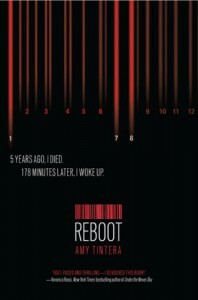 Based on the premise, I HAD to read it.Reboot starts off really strong. I loved Wren right away. Her strength. Her differentness from most other female characters. Even when the romance started, Wren stayed pretty true to who she was from the beginning. Oh sure, there is a bit of a softening, but it wasn't like she changed into a completely different character just because of a boy. As for Callum, it was hard not to like him. A little goofy, to be sure, but a nice balance to Wren's seriousness.The only really issue I had with Reboot was the pacing. One moment, plot build up. The next action. Then details. Then more action. It had enough action and plot to keep me entertained, but some of the down moments were a little flat for me. However, by the end, which is a cliffhanger by the way, I was totally on board with this being a series.Final Verdict:There are parts of Reboot that I loved. Then, there are parts that I was bored. Combined, Reboot was a decent read that left me wanting more by the ending.Will I read the next installment:If the cliffhanger had not been set up as it was, I am not sure this would have been a series that I would have wanted the next installment to. While I did like the read, it wasn't one that I loved every moment of. So, yes, thanks to the cliffhanger, I think I will try the next one.